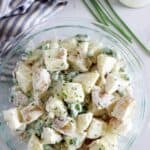 This classic potato salad recipe is perfect all year round. 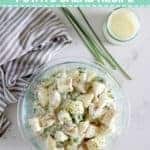 You can add any extras that you like and the homemade potato salad dressing is the best! When I was at university and I had to take a salad to a BBQ, I would always take potato salad. I was soooo fancy back then – cook some spuds, chop them up and throw in a jar of potato salad dressing. Genius! I’m happy to say things have changed a little bit since then. 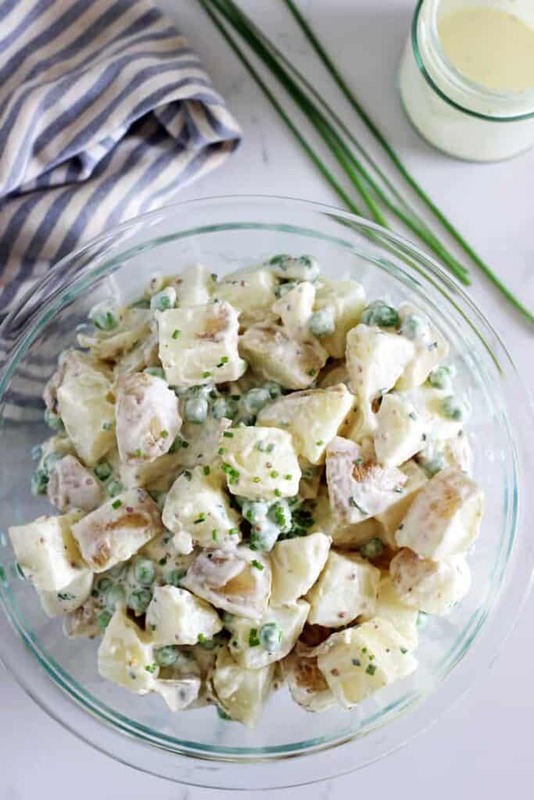 Not only are we making our own mayonnaise we are turning that into an epic homemade potato salad dressing that is being added to potatoes, bacon, peas and whatever else you like adding to your potato salad. Click here to Pin this to your salads and sides recipe board to save it for later. 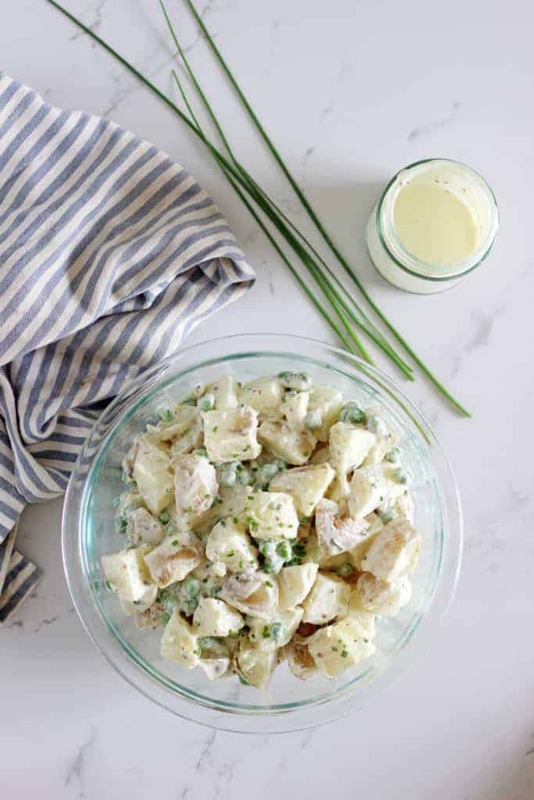 The great thing about potato salad as a side dish is that it can be made in advance! In fact, I think it is one of those rare salads that actually tastes better if it’s been left in the fridge for at least a few hours, if not overnight. No need to be in a mad panic right before you leave, or fussing with taking dressings in jars and making sure that they get stirred through at the exact right moment before the lettuce wilts – this is a strong salad that will stand up to transportation and not being treated like a baby. Perfect! The dressing is super simple – homemade mayonnaise if you feel like it, otherwise use your favourite store bought one, add apple cider vinegar, dijon and wholegrain mustard and salt & pepper and shake together. So easy! Like I said before, I like adding peas and bacon to my potato salad – personally, I also love adding corn or gherkins, but Josh doesn’t like either of those, so I often put some in small containers and serve alongside the salad – that way I can add them but Josh doesn’t have to go through picking them out of his salad! I know some people who also add egg to their potato salad and it most definitely would be welcome here! 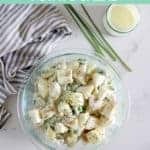 Make this next time you need to take a salad to a potluck or if you are just having sausages on the BBQ for a lazy summer dinner! 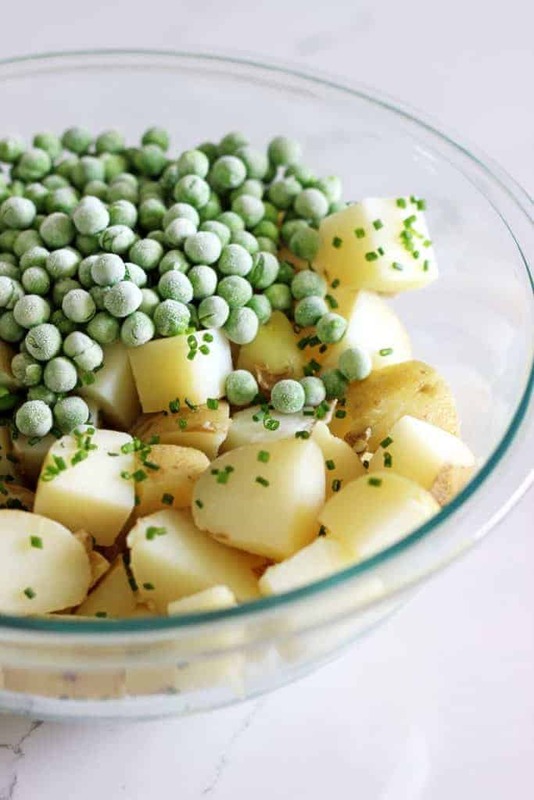 Add potatoes, bacon or ham, peas and chives (plus any other add-ins) to a large mixing bowl. 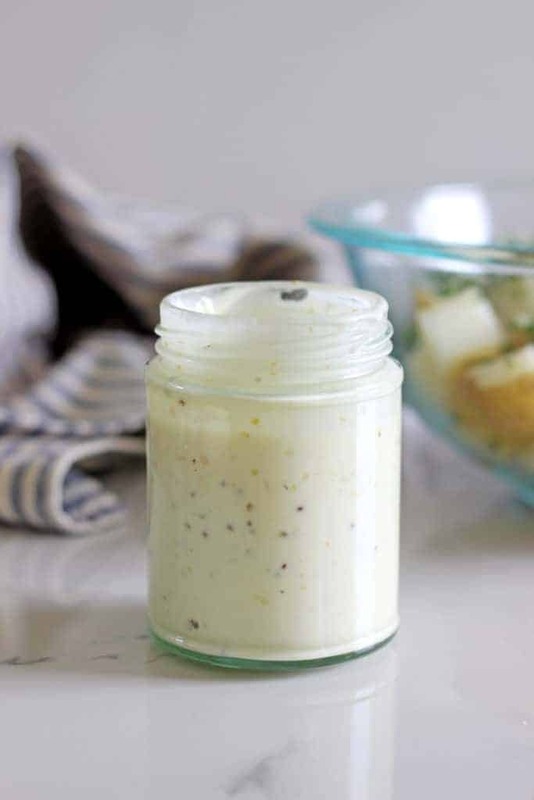 Add all potato salad dressing ingredients to a small jar, tightly screw on the lid and shake together. Pour over the potatoes and mix together well. Serve immediately or cover and store in the fridge for a few hours before serving. Salad will keep in the fridge for a few days. 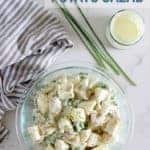 I also like adding corn or gherkins to my potato salad but as not everyone like them, I tend to serve them on the side – that way anyone who wants, can add them to their salad as they eat!